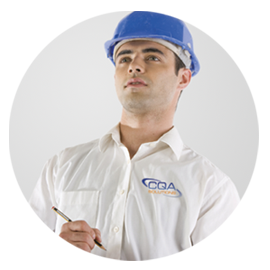 Top to Bottom our organization is devoted to all aspects of Environmental CQA. CQA is not for the faint of heart with it’s demanding work environment, never ending stream of details to document, and down right crazy schedules. While most sane people would look for a much easier task, we run towards it and we LOVE it! Our focus and drive has led us to build systems and programs that can enrich our industry and we would love to share them with you! Authored by Glen Toepfer of CQA Solutions, Ltd., The Complete Field Guide to Ensuring Quality Geosynthetics Installations reveals the inner workings of geomembrane installations to unparalleled depths, navigating the balance between complex relationships, the rigors of field installation and external influences that ultimately determine the success of the project. Each chapter exposes quality and cost concerns for delivering an installation that provides a rock solid Return on Investment for Site Owners. 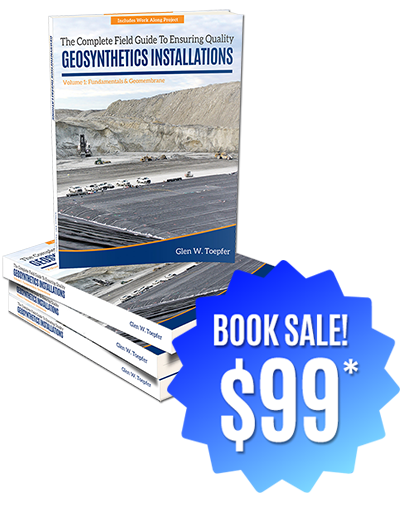 The Complete Field Guide to Ensuring Quality Geosynthetics Installations is your must-have reference manual for in the field. Order yours today! True stories that are both educational and entertaining, plus vibrant, full-color images bring concepts to life. The demand for certified CQA professionals is on the rise – don’t be left behind! Give your staff the credentials that will make a difference and increase your potential to bid and win projects. Students will be certified through GCI-ICP upon passing the certification exam. Knowing your strengths and weakness can make all the differences. Our courses come with a Profession Evaluation Exam. This pre-course test provides the student and organization with an understanding of the individual’s current knowledge base, allowing the student to focus on desired areas of improvement. CQAS fully supports the steps IAGI has taken to quantify installation technician experience and quality. CQAS has several individuals certified to proctor the CWT (Certified Welding Technician) exam. Do you need certified welding technicians on your team? Contact us today to schedule your certification training. We can even come to you! If you are new to IAGI, please visit their website. 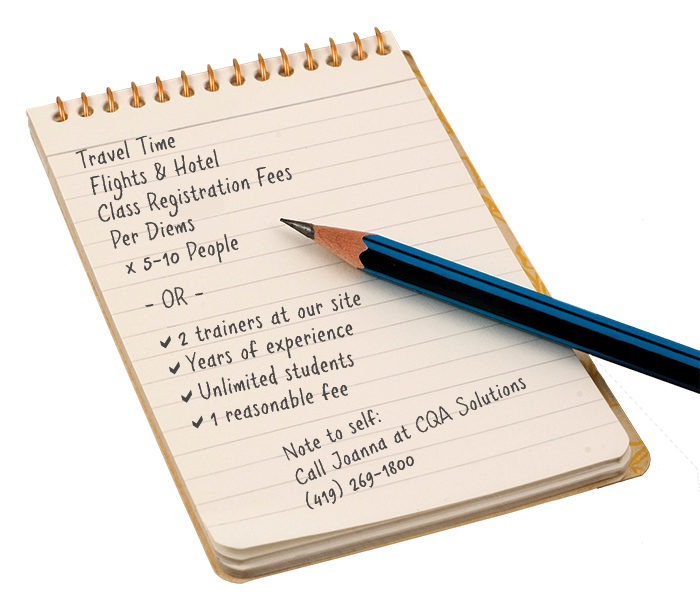 For more information on classes at CQAS, please refer to course descriptions and pricing below.To bring these classes to you, check out our Mobile Solutions. This class will introduce the student to practical applications for conducting thorough field CQA of compacted clay liners and provide a solid foundation for a variety of fieldwork situations. Upon completion of this course students will be equipped with the knowledge and techniques that create solid field performance. Skills should include: basic mapping, standard calculations, test evaluations required for day-to-day field CQA, performing complex field tasks, comprehensive data review and advanced troubleshooting of compacted clay liners. From beginners to liner system veterans, this course should be considered a prerequisite for everyone on a jobsite. Based on the new book The Complete Field Guide to Ensuring Quality Geosynthetics Installations by Glen Toepfer, this training details the processes and protocols that lead to repeatable quality, as well as the roles and responsibilities of everyone on the project. The job QT technicians perform is critical in providing owners with a quality product that will provide a solid return on their investment. To that end, even novice techs leave this training with the knowledge of a 20-year veteran. We don’t believe it too strong to say that this training, and the accompanying manual, will revolutionize liner system CQA. Upon completion of the course, students should be able to understand and perform basic tasks associated with each of the categories, as well as having tips for thorough paperwork. The Professional Evaluation Exam can be added to gauge current knowledge level so we can customize the training to fit your specific needs. Are you ready for your CQA professionals to obtain certification in geosynthetic materials through a nationally recognized association? This class is a one-day preparatory class, followed by the 2-hour GCI-ICP Geosynthetics Materials exam. This course will give the students not only the knowledge they need to pass the certification exam, but real-life examples of situations they may find themselves in, and how to deal with these circumstances appropriately. The class will also cover various intricacies of geosynthetics CQA, such as required documentation, and conflict resolution. Give your staff the credentials that will make a difference. Students understand the principles behind geosynthetics manufacturing, various products and their uses, proper construction procedures, testing procedures, interpretation of test results, proper documentation requirements, and conflict resolution. Certification through GCI-ICP upon passing certification exam. Increase your potential to bid and win projects with elevated credentials. Students must register for their exams with the Geosynthetics Institute prior to training. CQA Solutions is not affiliated with the Geosynthetics Institute. CQAS will not have any role in grading this exam, as the exams will be mailed to the GSI. Are you ready for your CQA professionals to obtain certification in compacted clay liners through a nationally recognized association? This class is a one-day preparatory class, followed by the 1-hour GCI-ICP Compacted Clay Liners exam. This course will give the students not only the knowledge they need to pass the certification exam, but real-life examples of situations they may find themselves in, and how to deal with these circumstances appropriately. The class will also cover various intricacies of earthwork CQA, from interpreting field test results (such as nuclear densitometer), required documentation, and conflict resolution. Give your staff the credentials that will make a difference. Students must register for their exams with the Geosynthetics Institute prior to training. Students must register for their exams with the Geosynthetics Institute prior to training. CQA Solutions is not affiliated with the Geosynthetics Institute. CQAS will not have any role in grading this exam, as the exams will be mailed to the GSI. Certify more and spend less. WE can come to YOU with Mobile Solutions! Please call for a quote. Travel expenses will be included. Travel includes: Flights or Mileage and per diem if needed. Make the most of your training dollars by customizing your training to the needs of your staff. We offer a professional report on the individual exam results that will allow you to better understand your staff and help us customize your training experience. Call for details on your specific package.